As with all campaigns that have ambitious targets, the task is tough in the face of harsh realities, a sceptical to cynical public, media, political and business class. And yet things change – suffrage, civil rights, human rights – even in recent times, debt cancellation was at first laughed at, and only a few years ago, taxation was very far from centre-stage. It is time for us all to combine our energies and target military spending – in time, we can reverse the current trend and we can do it by a combination of keeping to the big vision while at the same time, respecting the need for the challenge of achieving this in the real world where political decision-making, foreign policy and defence industry profits combine to present us with well-funded and self-interested adversaries. This campaign is about shifting – through our 5% Formula – from military spending to ‘what the world needs and wants’ via a formula that is reasonable but yet which, if implemented, will deliver truly radical cuts to a budget line that does not deliver value for the vast majority of people on this planet yet which is funded by them – to their detriment in many places. We hope that this may, in turn, lead to a genuine ‘paradigm shift’ in the public perception on the ‘who, what, where and why’ of the global military spending. There is already huge debate in many countries about how defence budgets can be cut – especially in times where ‘austerity measures’ are being forced on public services and family incomes. While some cuts are underway – SIPRI shows in 2011 that only one sub-region, Western and Central Europe, saw a very slight fall in military expenditure, of 1.5%. Therefore, there remains ample room for more to be done, eg the proposed 5% figure (cuts and threshold). Such a measure could become ‘in-built’ over time, with the formula we are proposing. Recent trends in military expenditure (SIPRI, 2012) World military expenditure is estimated to have been $1738 billion in 2011, corresponding to 2.5 per cent of world gross domestic product (GDP) and $249 for each person in the world. In real terms, the total is virtually unchanged since 2010; the real-terms increase of 0.3% is not statistically significant given the uncertainties in the estimate. This breaks 12 years of continual increases in military spending from 1998-2010.The data show a very mixed pattern of increases and decreases around the world in 2011, with as much variation within as between regions. Overall, 61 countries increased military spending in real terms in 2011, while 62 reduced it.The sub-region with the most rapid growth in military expenditure over the 10-year period 2002-2011 was North Africa, with a real-terms increase of 109%. The bulk of this growth (75%) is accounted for by Algeria. The other sub-regions with the largest increases since 2000 are Eastern Europe (86%), East Asia (69%), Central & South Asia (62%) and North America (59%). Only one sub-region, Western and Central Europe, has seen a very slight fall in military expenditure, of 1.5%. The USA’s military spending accounted for 41 per cent of the world total in 2011, followed by China with 8.2 per cent, Russia with 4.1% and the UK and France with 3.6 per cent each. Austerity and deficit-reduction measures in the wake of the global financial and economic crisis that broke in 2008 are beginning to lead to reductions in military spending in the US and Europe. US military spending in 2011 amounted to $711 billion, a nominal increase on 2010 ($698 billion), but a fall of 1.2% in real terms – the first such fall since 1998. The fall is largely due to the long delay in Congress agreeing a budget for FY2011 amidst disputes on how to reduce the budget deficit, which meant that procurement plans could not be taken forward, so that outlays were considerably lower than planned. Meanwhile, the Budget Control Act passed by Congress in July 2011-which cut $487 billion over ten years from previous military spending plans-combined with the withdrawal of US forces from Iraq and the planned drawdown in Afghanistan, are likely to lead to falling total US military spending over the coming years. In Europe, especially Western & Central Europe, most countries have been imposing austerity measures to reduce their budget deficits, with heavy cuts in public expenditure, usually including military expenditure. Since 2008, two thirds of countries in Europe have cut military spending, although the rates of cuts have varied considerably. Some of the largest cuts have been in Central Europe, where the generally weaker economies have been unable to sustain such large budget deficits. Eighteen European countries have seen real-terms falls of more than 10% in military spending since 2008, of which 13 are from Central Europe. Eight of these have made cuts of greater than 20%, with all but one from Central Europe. The largest fall has been in Latvia, by 51%. In Western Europe, the largest falls have generally been in countries facing acute debt crises: Greece (26%), Spain (18%), Italy (16%), and Ireland (11%), as well as Belgium (12%). A number of countries, however, have bucked the trend, and have increased military spending since 2008. These are mostly countries who have emerged from the crisis largely unscathed, in particular Poland, Turkey and Norway. The biggest three spenders in Western & Central Europe: the UK, France and Germany, have so far made only modest cuts in military spending since 2008, by 0.6%, 4% and 1.6% respectively. The UK and Germany plan further cuts, the UK by 7.5% in real terms up to 2014/15, and Germany by about 10% to 2015. France, however, plans roughly constant real spending up to 2013. In Eastern Europe, however, Russia has continued its long-term increase in military spending, after a slight downturn in 2010. The increase of 9.3% in real terms in 2011 took Russia to third place in the list of top global military spenders, overtaking the UK and France for the first time since the early 1990s. Further increases of around 50% in real terms are planned up to 2014, in line with plans to replace 70% of Russia’s mostly Soviet-era military equipment with modern weapons by 2020. Meanwhile, Azerbaijan made the largest increase in military spending worldwide in 2011, 88% in real terms, amidst increasing fears of renewed conflict between Azerbaijan and Armenia over the disputed region of Ngorno Karabakh. In Asia, Chinese military spending continued to increase, by 6.7% in real terms, faster than in 2010 but slower than during most of the 2000s. Total military spending for the rest of Asia & Oceania remained constant. Military spending in Latin America fell by 3.3% in real terms, with an 8.2% cut in Brazil accounting for the whole regional drop. African military spending increased by 8.6%, but this was entirely down to a massive 44% increase in the continent’s largest spender, Algeria. Military spending for the rest of Africa was essentially unchanged in 2011. All three of these regions saw an extremely mixed pattern of increases and decreases, with largely equal numbers of each. Only in the Middle East, where military spending increased by 4.6% in real terms, was there a clear pattern, with the great majority of countries for whom data is available increasing military spending in 2011. However, the totals for Africa and the Middle East are both highly uncertain, due to the absence of data in 2011 for a significant number of countries, including some major spenders. 2.3.1.1.1 The Sustainable Defense Task Force – Cuts that would Save $960bn over 10 Years. This high panel bi-partisan task force was formed in response to a request from Representative Barney Frank (D-MA), working in cooperation with Representative Walter B. Jones, Representative Ron Paul and Senator Ron Wyden, to explore possible defense budget contributions to deficit reduction efforts that would not compromise the essential security of the United States. In June 2010, it produced a highly detailed report Debt, Deficit And Defense. It explored how to deliver cuts to defense without compromising security and which acknowledged both the need to rein in excessive spending as well as re-shape the military role of America in the world. It assessed that the maximum amount that could be saved was approximately $960bn 2011-2020. CAP develops new policy ideas, critiques the policy that stems from conservative values, challenges the media to cover the issues that truly matter, and shapes the national debate. Its founder is John Podesta, former White House chief of staff to President Clinton. He served in the president’s cabinet and as a principal on the National Security Council. In 2011 CAP produced a report on ‘Sensible Defense Cuts’ of $400bn 2011-2015, again, detailing how it saw where these cuts could be made. Divert Military Spending According to research by the Institute of Policy Studies, viable expenditure cuts to the US military budget in only three areas – ending the war in Afghanistan, reducing overseas military bases and eliminating programs that are obsolete or wasteful – would free up $252bn.Such measures would reflect a less aggressive approach to foreign policy by the US and other governments, as long demanded by civil society and voiced most prominently in response to the impending invasion of Iraq in 2003. Aside from the unacceptable and massive loss of life inflicted by this single conflict, its economic costs were – and continue to be – significant.Reducing spending on nuclear weapons is another key budget area ripe for cuts. Despite near universal membership to the Non-Proliferation Treaty (NPT) since its inception in 1968, progress on nuclear disarmament remains limited. It is crucial that India, Pakistan, 10A report by a Task Force on a Unified Security Budget for the United States has outlined reductions of over 10% of US military spending, detailing $77bn of the “lowest hanging fruit.” The figures show that reducing wasteful military spending alone can yield significant budgetary savings. Such findings bolster the viability of a growing US-based campaign that seeks to reduce military spending by 25% on a state-by-state basis, which could free up almost $178bn in public finance. The campaign has the support of public representatives and organisations across the country and calls for the savings to be redirected to secure urgent domestic priorities, including jobs and access to housing, healthcare, education and clean energy. Trident is set to account for 35% of the military budget – this is one easily ‘axe-able’ item. Yet, despite disquiet from many quarters – including some in the military – it would appear the government would rather cut back on people than equipment. In early 2013, the UK government announced it will cut 25,000 armed forces personnel as part of its savings programme. The Ministry of Defence has to lay off 54,000 staff by 2015, in an effort to reduce expenditure by £4.1bn. The Ministry of Defence is in the process of cutting 25,000 armed forces personnel and 29,000 civilian staff by 2015, in the biggest round of cuts to the military since the end of the Cold War. The reductions, set out in the Government’s 2010 Strategic Defence and Security Review, are intended to helping close the £38bn “black hole” in the defence budget. Meantime, Trident is expected to cost £100bn over its lifetime. Philip Hammond, UK Defence Minister, has said that while cuts to defence spending were necessary, the one area that would not be affected would be equipment. David Cameron has also said, if re-elected in 2015, that defence spending would protected from further cuts. The Royal United Services Institute forecast that “submarine and deterrent spending” is set to account for around 35 per cent of the total core procurement budget by 2021/22. Scientists for Global Responsibility would argue that all ‘Non-Offensive Defence’ spending should be on the table, arguing for the decommissioning of weapons systems that can be used for large-scale attack, eg nuclear weapons, aircraft carriers, long-range bombers/ missiles/ warships. As Greek society faces deeper and deeper cuts, where should it cut? Greece’s Austerity Doesn’t Extend to Its Arms Budget Greece continues to spend the most on arms in the EU as a percentage of GDP, while its people suffer economic hardshipThe fact that Greece, a relatively small and democratic country with not much in the way of global ambitions, should spend as much on its military as it does is perplexing. In 2006, as the financial crisis was looming, Greece was the third biggest arms importer after China and India. And over the past 10 years its military budget has stood at an average of 4% of GDP, more than £900 per person. If Greece is in need of structural reform, then its oversized military would seem the most logical place to start. In fact, if it had only spent the EU average of 1.7% over the last 20 years, it would have saved a total of 52% of its GDP – meaning instead of being completely bankrupt it would be among the more typical countries struggling with the recession.…when the first bail-out package was being negotiated in 2010, Greece spent 7.1bn euros (£5.9bn) on its military, up from 6.24bn euros in 2007.A total of £1bn was spent on French and German weapons, plunging the country even further into debt in the same year that social spending was cut by 1.8bn euros. It has claimed by some that this was no coincidence, and that the EU bail-out was explicitly tied to burgeoning arms deals. In particular, there is alleged to have been concerted pressure from France to buy several stealth frigates. Meanwhile Germany sold 223 howitzers and completed a controversial deal on faulty submarines, leading to an investigation into accusations of bribes being given to Greek officials.…Recent months have also seen continued pressure from Merkel and Sarkozy on Greece to honour its arms deals amid ongoing negotiations over the current bailout deal. …Interestingly, Portugal – another country currently in the news for its economic woes – is Germany’s second largest arms buyer after Greece. In the current context, it is easy to blame all Greece’s troubles on its problems with corruption, tax evasion and its oversized state sector. Yet one cannot help but speculate that if Greece’s military spending had been reined in sooner, it would not be experiencing the dramatic crisis it is going through now. And the Greek people, instead of facing austerity measures that have reduced living standards by 30%, might have been able to take a more moderate and sustainable route to reform. Despite austerity, NATO chiefs are of the opinion that NATO members should not let recession bite into defence budgets too much. In February 2013, NATO chief Anders Fogh Rasmussen urged allies to reverse damaging defense-spending cuts once their economies improve as U.S. officials warned of the impact that across-the-board U.S. budget reductions could have on the alliance. The debate on how to find ways to capture ‘new’ money to fund shortfalls in commitment to developing nations is now commonplace. This campaign would seek to draw on the processes and learning curves of campaigns such as Jubilee Debt or the Financial Transaction Tax – both of which have held close to an ambitious vision coupled with a complex demand but which have both been successful in overcoming hurdles to implementation – be that public support, political will, commercial resistance. The debt campaign harnessed the support of citizens of rich nations to lobby their own governments and of civil society in the global south. To date it has successfully seen the cancellation of 32 countries’ debt totaling $110 – money redirected to support public services. The method of applying debt cancellation through the Highly Indebted Poor Country process, while delivering for some countries, has proven to be too slow and has not worked for the many other nations who have a right to the cancellation of odious debt. The debt campaign continues to apply pressure to see the remaining debt cancelled. Also known as the Robin Hood Tax, the FTT campaign is led by Stamp Out Poverty. The FTT is a small tax (between 0.5% and 0.005%) on transactions involving shares, bonds, derivatives and foreign exchange. FTTs would raise substantial amounts of new revenue. £20 billion could be raised in the UK alone and as much as £250 billion every year if they were implemented globally. 25% to be used to fight climate change at home and aboard. German Chancellor Angela Merkel stated, “one could discuss the use of part of the revenues from the Financial Transaction Tax for development and climate adjustment”*. * Statement by Chancellor Merkel to the Development Committee of the Bundestag in November 2011. 1 The FTT would apply to large-value foreign exchange transactions (the wholesale market), not retail transactions – and so would not apply to people changing money to go on holiday or sending funds to relatives abroad. Having completed this first stage of development, these are some of the key areas of next stage research that will be undertaken in order to inform and shape this proposal further. Writing in the Washington Post, Pulitzer Prize-winning reporter and columnist Walter Pincus says “it is time to examine the funding the United States provides to Israel.” Aid to Israel is virtually the only program, domestic or foreign, that is exempt from every budget cutting proposal pending in Congress. No matter that our own military is facing major cuts along with Medicare, cancer research and hundreds of other programs, Israel’s friends in Congress in both parties make sure that aid to Israel is protected at current levels. Pincus describes just how absurd the Israel exemption is and that the aid to Israel package even includes an escalator clause, enshrined in law, to ensure that it can only go up, not down.Look for a minute at the bizarre formula that has become an element of U.S.-Israel military aid, the so-called qualitative military edge (QME). Enshrined in congressional legislation, it requires certification that any proposed arms sale to any other country in the Middle East “will not adversely affect Israel’s qualitative military edge over military threats to Israel.”In 2009 meetings with defense officials in Israel, Undersecretary of State Ellen Tauscher “reiterated the United States’ strong commitment” to the formula and “expressed appreciation” for Israel’s willingness to work with newly created “QME working groups,” according to a cable of her meetings that was released by WikiLeaks.The formula has an obvious problem. Because some neighboring countries, such as Saudi Arabia and Egypt, are U.S. allies but also considered threats by Israel, arms provided to them automatically mean that better weapons must go to Israel. The result is a U.S.-generated arms race.For example, the threat to both countries from Iran led the Saudis in 2010 to begin negotiations to purchase advanced F-15 fighters. In turn, Israel — using $2.75 billion in American military assistance — has been allowed to buy 20 of the new F-35 fifth-generation stealth fighters being developed by the United States and eight other nations.Something is terribly wrong here, most notably the fact that members of Congress from both parties are afraid to talk about it. After all, what would their constituents (not their donors) think about increasing foreign aid to Israel while we are cutting aid to education and health programs here? A portion of funds to be redirected from cuts to military spending to support the very many basic human rights outlined in the MDGs, led by UNDP, and which is now shaping the post MDGs/SDGs agenda. The 5% Formula would deliver an estimated $300 billion for international development in the first decade – that is $30 billion a year on average. WHO’s current biennium 2012-2013 budget is $3.9 billion (roughly $2 billion per year). It is proposed that from this redirected $30 billion, $1 billion – $2 billion of this could fund the WHO and enable it to remove its reliance on privates interests and others. This ‘new’ sustainable stream of public funding for WHO could ensure that it can again focus on its core missions and managing global health projects with the full involvement of the countries concerned both in both formulation and implementation level levels. Global civil society holds governments, international institutions (eg IMF, World Bank, WTO) and multi-national corporations to account – and it does so on meager resources. This proposal argues that a mechanism be created whereby a portion of funds redirected from cuts to military spending be allocated to support the work of those around the world campaigning for economic, environmental and human rights-based progress. This embraces the struggle to protect rights over natural resources (land, water, minerals). If the current concerns (as of May 2013) about lack of transparency and civil society participation can find a way to be addressed, then the new Green Climate Fund could be a significant funding route for climate resources pledged by developed countries for poorer nations. It has set a target of $100bn each year by 2020 to help them cut greenhouse gas emissions and adapt to the effects of global warming and is one possible route through which to direct a portion of the funds redirected from military spending into climate change related financing. The Green Climate Fund will contribute to the achievement of the ultimate objective of the United Nations Framework Convention on Climate Change (UNFCCC). In the context of sustainable development, the Fund will promote the paradigm shift towards low-emission and climate-resilient development pathways by providing support to developing countries to limit or reduce their greenhouse gas emissions and to adapt to the impacts of climate change, taking into account the needs of those developing countries particularly vulnerable to the adverse effects of climate change. The Fund will be guided by the principles and provisions of the Convention.The Fund will provide simplified and improved access to funding, including direct access, basing its activities on a country-driven approach and will encourage the involvement of relevant stakeholders, including vulnerable groups and addressing gender aspects.The Green Climate Fund was designated as an operating entity of the financial mechanism of the UNFCCC, in accordance with Article 11 of the Convention. Arrangements will be concluded between the Conference of the Parties (COP) and the Fund to ensure that it is accountable to and functions under the guidance of the COP. The PBF is a Multi-Donor Trust Fund (MDTF) of the Secretary-General (SG), designed as a rapid and flexible mechanism for addressing critical peacebuilding gaps in the immediate needs of countries emerging from, or at risk of relapsing into, violent conflict. The Fund focuses on interventions that demonstrate direct and immediate relevance to peacebuilding, and that have a catalyzing impact including on the sustained support and engagement of other key stakeholders. Funding for the United Nations and its agencies comes from two sources: assessed and voluntary contributions. Assessed contributions are payments made as part of the obligations that nations undertake when signing treaties. At the UN, assessments on member states provide a reliable source of funding to core UN functions through the UN regular and peacekeeping budgets, based on each country’s ability to pay. Voluntary contributions are left to the discretion of each individual member state. These contributions, which make up nearly half of all UN funding, finance most of the world body’s humanitarian relief and development agencies, including the UN Children’s Fund (UNICEF), the World Food Program (WFP), the UN Development Program (UNDP), and the UN Refugee Agency (UNHCR). Redirecting funds from military spending to peacekeeping; peacebuilding; depleted uranium clean-up; ongoing removal of landmines is suggested in this proposal as all these activities are grossly underfunded. This proposal suggests redirecting 50% of the saving that accrue from reductions to military spending to supporting each nation’s own domestic green economy. 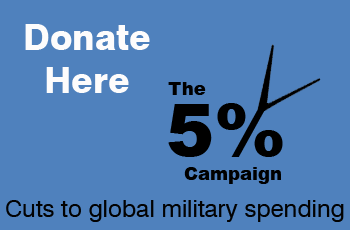 As with the diversion of 50% of military spend savings being redirected to urgent global needs, the majority of citizens of countries that comprise the largest military spenders may also need convincing of the need to divert the remaining 50% of excessive military spending towards growing their own green economy. But this is the challenge to take on. Below are examples of thinking on how military spending could (and should) be redirected towards much greater and pressing needs that face society as a result of the global recession as well as climate change. New opportunities UK governments have chosen to allocate taxpayers‘ money to support arms exports and production. Ending the support for military exports and the spending on prestige procurement projects would free up resources to help other sectors that might be more efficient and innovative and be likely to grow rather than decline. It is not within CAAT’s competence to explore these in detail.An obvious example, however, is the response to climate change. A key factor in addressing the threat is the rapid expansion of renewable energy research and development and production, and this requires public investment and skilled engineers. In 2008 UK government-funded research and development (R&D) for renewables was around £66 million, compared to over £2,500 million for arms. Arms industry workers have skills that are needed to meet these new challenges. BAE likes to portray itself as a major provider of high-tech jobs, but these jobs are dependent on R&D funding from the tax-payer; if the money changed sector it is likely the jobs would follow. Resources could be targeted at those locations which might be disproportionately affected during the changes, as clearly these areas would have workers with good skills to undertake alternative engineering projects.This was acknowledged by Dr Sandy Wilson, President and Managing Director, General Dynamics UK, and VP-Defence, ADS Group Ltd, when he gave evidence to the Defence Committee on 8th September 2010: “A point that I have made to this Committee previously is that the skills that might be divested of a reducing defence industry do not just sit there waiting to come back. They will be mopped up by other industries that need such skills. We are talking about high-level systems engineering skills, which are often described as hen’s teeth. It is an area in which the country generally needs to invest more. You can think of the upsurge in nuclear and alternative energy as being two areas that would mop up those people almost immediately. Then the question would be not of choice, but of them just not being there.”Resources should be transferred from supporting the arms companies to addressing what is widely acknowledged as the biggest threat to human security. Before the products are available to export, they must be developed. A rapid expansion of renewable energy R&D and production is necessary, and this requires public investment that will, in turn, draw in skilled engineers. Tackling climate change rather than producing arms would win almost universal support and leave the UK and the world a more secure place for future generations. At the same time significant economic benefits will accrue from scaling down a stagnant industry dependent on Government support, and ramping up new sectors where demand is increasing rapidly. There has been much work done on how economies can shift resources and employees from the defence industries into more socially beneficial sectors. The Bonn International Centre for Conversion is one such longstanding resource on this. The UK could benefit from more open discussion about the benefits that could accrue to the society if we were to convert or transfer jobs from defence to other sectors. Dr Stephen Scholfield’s ‘Oceans of Work: Arms Conversion Revisted’ for BASIC in2007, referenced earlier; or his report for CAAT, ‘Making Arms, Wasting Skills, in 2008 explains why and how such an approach could work. And in its submission to the Business, Innovation and Skills Committee inquiry into Government assistance to industry (Sept 2010), the Campaign Against Arms Trade reported that UK government-funded research and development (R&D) for renewables was around £66 million, compared to over £2,500 million for arms. From a Cold War peak in 1989 to the low point of 1997, the U.S. government cut military spending by one-third, and weapons procurement by two-thirds. More than two-and-a-half million defense workers lost their jobs. Forecasts of economic disaster that would result from this economic shock proved wrong. But a policy sufficiently robust to turn these savings into a productive peace dividend, and solidify them with new designs for cooperative security, fell short of what was needed….The [Obama] administration is, however, trying to revive some programs that had been languishing since the post-cold war period, and adapt them to this new mission. In 1992 Congress appropriated funds—totaling less than $100 million–to government programs that would “allow defense industries to convert to civilian activities.” Part of this money was devoted to expanding a network of Manufacturing Extension Centers. The new centers would refocus their mission to give special attention to the problems of small- and medium-sized businesses needing to adapt their technology to new civilian work. The Bush administration cut funding for the Centers; the Obama administration used Recovery Act money to restore funding and to redirect the network toward the green-economy-building mission. In February of this year a large coalition of manufacturing associations, including the National Association of Manufacturers, the Business Council for Sustainable Energy, and the National Electrical Manufacturers Association, wrote to the Senate majority leader about the need to “provide significant stimulus to the manufacturing sector for investments in energy efficiency and tooling for the production of energy-efficient and clean energy products.” They focused on two key recommendations: $4 billion for energy-efficient manufacturing grant program and an additional $50 million for the Manufacturing Extension Partnership (MEP) Program….We wasted the peace dividend opportunity. But we are fortunate to have a second chance. The current leadership recognizes the importance of green jobs. It has already devoted some funds in the initial stimulus package to encouraging green technology. It has embraced nuclear abolition and promised to wind up the wars in Iraq and Afghanistan. And it acknowledges the climate crisis and the role the United States must play to address global warming. To date, however, the Obama administration has not integrated these insights into a green dividend: a major shift of resources from the military budget to sustainable energy. It is not too late to make this shift.The trick of the green dividend is to ensure that new manufacturing jobs are created to replace the defense sector employment. These new jobs are necessary to ensure support of unions, industry, and the politicians who will refuse to cut even the smallest fraction of the U.S. military budget as long as it generates employment. The green dividend is perhaps our last shot at transforming the U.S. economy. We have been given a second chance. If we blow it this time, there will not likely be another. The Green Dividend was published in 2010 by Miriam Pemberton, a Research Fellow at the Institute for Policy Studies and Peace and Security Editor of Foreign Policy In Focus project. She leads the team that produces the annual “Unified Security Budget for the United States.” John Feffer is co-director of Foreign Policy In Focus at the Institute for Policy Studies. The previous box is a summary of efforts under Clinton to cut military spending while funding programmes to help redirect defence jobs into civilian areas; why it lapsed and why this effort needs to be revived now, with a focus on renewables. On the other hand, the Pentagon – often fighting wars concerned with oil supplies and itself being a major user of oil, is now looking to go green. Perhaps this is the ultimate endorsement of the argument for action on climate change – coming from some who, strangely enough, think it will make the US military ‘ better fighters’. The U.S. Marine Corps has launched the 10X10 campaign aimed at reducing energy intensity, water consumption and increasing the use of renewable electric energy. With an annual energy budget of approximately $20 billion, the Defense Department incurs more than $1.3 billion in additional energy costs for every $10 increase per barrel rise in the world market price of oil. In addition to vulnerability to price fluctuations, the department’s reliance on fossil fuels also compromises combat effectiveness by restricting mobility, flexibility and endurance on the battlefield. Is it counter-intuitive to think that such a campaign could lead with USA public opinion on defence cuts? The average proposed level of spending was $435 billion—$127 billion below 2012 levels, representing a 23% cut. Among Republicans, the average proposed level was down $83 billion (a 15% cut); among Democrats, it was down $155 billion (a 28% cut); and among independents it was down $147 billion (a 26% cut)… A majority reduced defense spending by at least $63 billion, or 11%—thus down to $499 billion—with many in this majority reducing it by more. In a recent CBS/New York Times poll, the public overwhelmingly favored cutting military spending (52 percent) over cutting Social Security (13 percent) or Medicare (15 percent). And when it comes to taxing the rich, the public says bring it on! By a lopsided 67-29 margin, the public thought taxes on households earning $1 million or more a year should be increased to help deal with the budget deficit. It seems the UK public don’t yet see military spending as an issue to be concerned with ie as necessary to cut. YOU GOV POLL 2012 In the UK spent £39.4bn on defence, making it the world’s fourth highest military spender after the US, China, and Russia. Here in YouGov’s Politics Lab, we wanted to hear your views on whether you believe the UK government is spending too much, too little, or the right amount on defence.The highest proportion of those who took part in the debate said that too little was being spent on defence. Participants who held this view said that a well-funded military was necessary to maintain Britain’s status in the world, as well as to defend its homeland and territories. A smaller proportion of you told us that the UK spends too much on defence. Those who were of this view said the government was spending on the military for the wrong reasons, and that the money would be better spent on public services, such as the NHS. A very small proportion of participants said that the UK was spending the right amount on defence. This group said that the budget was about right for the military’s necessities and commitments around the world, but questioned whether the MoD was making the best spending choices. In September 2011, Transatlantic Trends undertook a ‘A comprehensive annual survey of American and European public opinion”, with polling conducted in America, Turkey and the 12 countries that make up the European Union. Asked about cuts to the military, there was clear lack of desire on the part of EU participants. In the UK, only 18 per cent approved of cuts to defence spending – the lowest of them all. There was only one country – the Netherlands – where more people wanted cuts to defence spending to outstrip cuts across government. And across the EU, 17 per cent were in favour of an increase, 46 per cent wanted spending to stay the same, and 34 per cent wanted cuts. When asked whether their government should increase spending, maintain current levels, or reduce spending, most respondents chose either to maintain or reduce spending in general. In fact, in 9 of the 14 countries surveyed, a plurality of respondents wanted to reduce government spending. However, when asked about defense spending in particular, in 10 of the 14 countries, a plurality wanted to maintain current levels of military outlays (see chart 23). On average, 50% of those in the EU countries surveyed wanted to decrease government spending, 29% wanted to keep current levels, and 16% wanted to increase spending. But when asked about defense spending, 34% wanted to decrease spending, 46% wanted to keep current levels, and 17% wanted to increase (see chart 24). A fairly similar pattern was true in the United States. Sixty one percent of Americans wanted to decrease government spending, 19% wanted to maintain current levels, and 17% wanted to increase spending. But when it came to defense spending, only 34% wanted to decrease, 45% wanted to maintain levels, and 19% wanted to increase defense spending. In 1973, the UN General Assembly adopted the Resolution 3093. It was a breakthrough as the first time resources spent on military and those needed for development were openly put in interconnection. It acknowledged that reduction in military spending would not only help to limit the arms race, at the same time it would make it possible to use the substantial resources for development. reduce their military budgets by 10% and use the money to help developing countries. It encouraged other developed countries to reduce their military budgets. It went as far as to establish the Special Committee on the Distribution of the Funds released as a Result of the Reduction of Military Budgets. In the following years, this resolution has been followed by a sequel of similar resolutions, though none of them has repeated the 10% option. The last resolution on ‘relationship between disarmament and development’ adopted last year only ‘Urges the international community to devote part of the resources made available by the implementation of disarmament and arms limitation agreement to economic and social development. This resolution was adopted without a vote. The resolution from 2007 has been adopted by 179 countries, only USA was against, France and Israel abstained. More than thirty years have passed since 1973, twenty-five resolutions urging developed countries to reduce their military budgets have been adopted, yet almost nothing has been done.